Twelve lawmakers elected on the opposition coalition’s joint ticket made an official appeal on June 13 to the parliamentary chairman to renounce their MP mandates. The twelve are: Levan Gachechiladze; Davit Gamkrelidze, leader of New Rights Party; Zviad Dzidziguri – Conservative Party; Koba Davitashvili – leader of Party of People; Eka Beselia– Movement for United Georgia; Gubaz Sanikidze – National Forum; Giorgi Khaindrava – individual member of the bloc; Pikria Chikhradze – New Rights Party; Davit Saganelidze – New Rights Party; Mamuka Katsitadze – New Rights Party and Irakli Iashvili – New Rights Party (currently out of the country, but planning to make the appeal on Monday on his return). Konstantine Gamsakhurdia, leader of Party of Freedom, made an appeal on June 12. 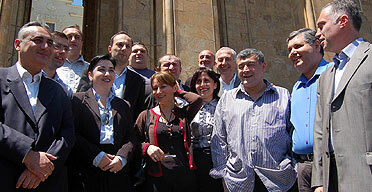 Fifteen MPs were endorsed on the bloc’s joint ticket through the party-list, proportional system. Opposition leaders earlier annulled their entire list of MP candidates so no one in the list would be able to take the vacant seats in Parliament. The bloc also won two additional seats – apart from the fifteen - by wining majoritarian contests in Tbilisi’s two single-mandate constituencies – Davit Gamkrelidze in Vake and Davit Saganelidze in Didube. Their decision to renounce their MP mandates entails by-elections in both constituencies sometime this autumn. The opposition coalition endorsed a total of seventeen MPs in the new parliament, but four of them - Paata Davitaia, leader of On Our Own party; Dimitri Lortkipanidze, who was a member of Georgia’s Way Party; as well as Gia Tortladze and Giorgi Tsagareishvili all quit the bloc after the election and refused to renounce their MP mandates. The Labor Party, which has endorsed six of its members in the new parliament, said it was also boycotting the new parliament. It said, however, that it wouldn't make any official appeal to the parliamentary chairman on renouncing their MP mandates. “We call on all Georgian people to join the resistance movement, which aims at holding free and fair repeat elections,” Davit Gamkrelidze, the New Rights Party leader, said.